I’m a big fan of Mr. Klein’s work, but I don’t find his thesis persuasive in this case. Instead, I’d suggest that the evidence points toward a considerably less exciting conclusion. Rather than being an early 1990s moderate Republican, Mr. Obama is a prototypical, early 2010s Democrat. And here we miss the point by taking things too literally. I think Nate's argument would've been complete with some kind of mathematical evidence to show that it's the early 2010s, so obviously Obama can't be an early 1990s moderate Republican. In any event, it's no surprise that Obama and current Democrats line up so closely. These two things aren't independent variables. Obama's the leader of the Democratic Party and he sets its agenda. I don't know how you use data like Nate's to evaluate agenda-setting choices, when each of several choices would leave a large number of Congressional Democrats with no real option but following along. Three lines, and it tells you a lot. Unrelated to the current discussion, I like how it supports the Civil Rights Act theory of why bipartisanship died. 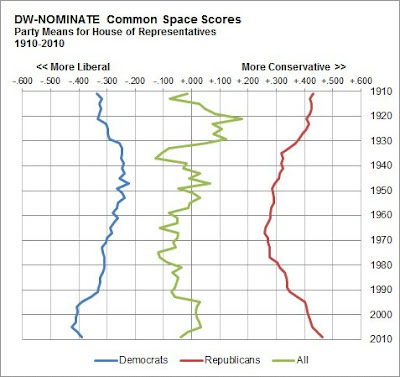 Basically, you go from having 3 groups -- segregationist Dixiecrats, pro-labor Northern Democrats, and pro-business Republicans -- to the current 2 groups that fit better in ideologically coherent parties. The Dixiecrats form the core of the new Republican Party and the more moderate Republicans become Democrats. 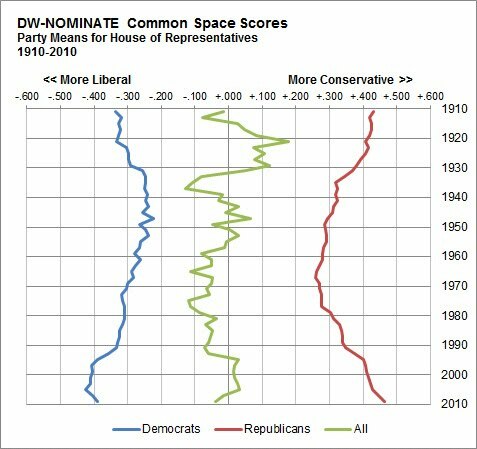 On this chart, the closest things get is in the mid-1960s when the Civil Rights Act passes, and the parties separate from there.